This charming inkstand beautifully employs the complex Boulle marquetry technique, and is a wonderful decorative piece with an intriguing history. Though a product of the English Victorian period in the 19th Century, this beautiful inkstand makes excellent use of the Boulle marquetry technique pioneered in 17th Century France. The inkstand is built from ebony and inlaid all over its surface with intricate, scrolling decorations in brass. The base of the stand uses what is known as 'premiere partie' Boulle marquetry, or brass inlaid on ebony, while the inkwell above utilises 'contre partie' marquetry, or ebony inlaid on brass. 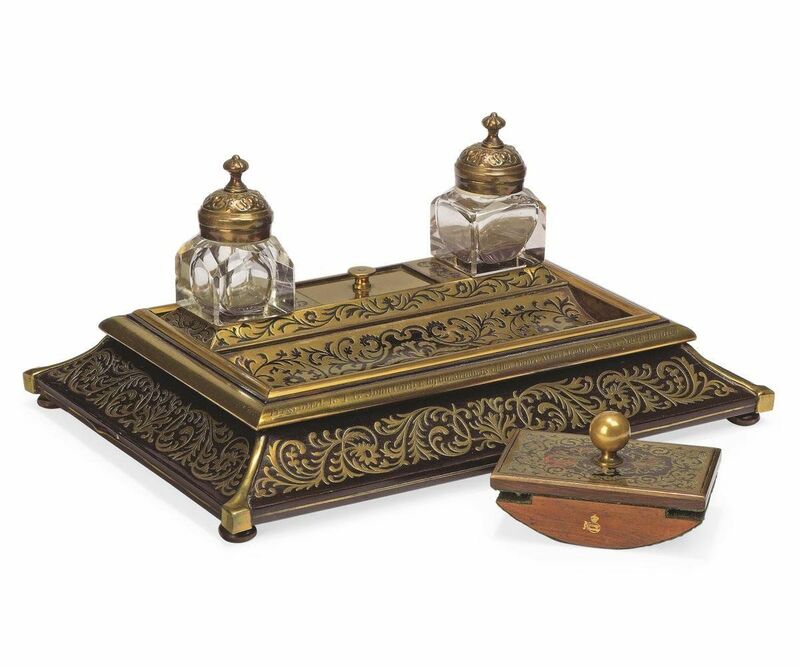 The inkstand is rectangular in form and contains two cut glass inkstands with brass lids. It comes with a rosewood ink blotter, presumably made for the inkstand later on in the 19th Century. The blotter was made by the London-based firm J.C. Vickery in c. 1900. It features similar, scrolling Boulle-style inlaid decorations in tortoiseshell and brass on its top, and is stamped 'JC VICKERY REGENT ST' on its side. The piece was formerly the property of a member of the Manchester Unity of Odd Fellows, a Victorian-era fraternal society established in order to provide healthcare, sickness benefits and insurance for its members. The Oddfellows were local precursors to Britain's national welfare state of the 20th Century. The engraving around the rim of the stand reads 'Presented to P.G. John Carter by the Members of the Prince Albert Lodge No. 2235 North London District Manchester Unity of Odd Fellows, in acknowledgement of valuable and disinterested services rendered to the Society & in testimony of their personal friendship & esteem for his integrity and consistent conduct as a useful working member Jan. 1853'.